The High Street entrance to Scott’s Alley was closed off and it became a court in about 1886. It was then entered only from Oldbury Road. This remained the case until the late 1950s when the remaining cottages were demolished and Sweets built a pair of garages across the entrance. The alley itself is slowly being absorbed into the gardens of the houses along the south of Trinity Street. The alley was named after Mr Scott, a whitesmith (tinsmith) and bell-hanger. He had a shop on the High Street and workshops in the alley. This probably explains the relatively small number of houses in the alley. In 1841 there were six households, and by 1881 this had reduced to two, with a common toilet and washroom. 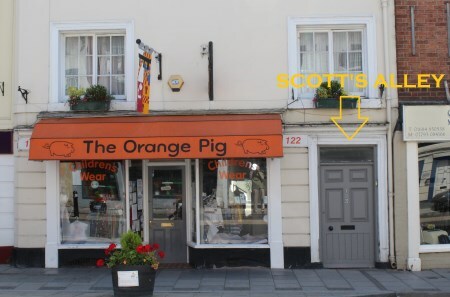 The ‘front house’ is now the Orange Pig, which would have been Scott’s ironmonger’s and the alley entrance is now the door to 123 High Street. By 1870, it had become a ‘Hodges’ Beerhouse’ (later to become the Brewer’s Arms). Samuel Hodges was described as a brewer and his wife as a Tobacco pipe manufacturer. It seems that moulding clay pipes was a cottage industry, and the cottage in Lilley’s Alley called ‘Clay Pipes’ is evidence for this. The Hodges were owners of one of Tewkesbury’s two ‘clay pipe factories’ where the pipes were fired in kilns. Pottery kilns and cottages make uncomfortable neighbours in alleys, and the residents were obviously unhappy. It first hit the news in 1876 when John Taunton was summoned for threatening a boy who was shaking the dust out of the factory’s mats in the alley. In 1879, the council considered a complaint about smoke and excessive heat. They were worried about the effect on the cottage it was attached to, but stopped short of ordering its closure. They ordered Mr Hodges to raise the chimney by 20 feet. He promised to do this, and to change from burning coal to coke. He, of course, prevaricated. In 1880, the surveyor reported that all was satisfactory, and nothing more is heard about the matter, probably because the kiln was shut down. 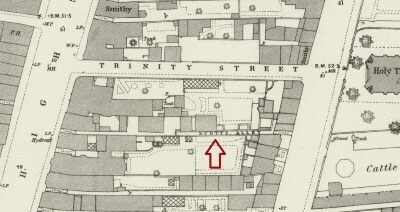 In 1882, the Brewers Arms was sold, with part of Scott’s Alley. In 1883, the beer licence was removed because the property had become a private dwelling. Soon after this the High Street entrance was closed off, with half of the alley being lost to public view, and only three houses remained, with access from Oldbury Road. This entrance is still marked by the pair of garages next to No. 11, the Trinity Church offices, which closed it off. 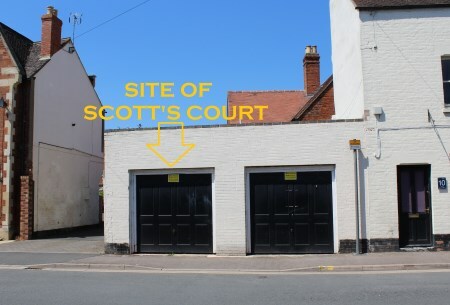 The story of Scott’s Court mirrors that of many alleys. The houses, were the ‘typical’ three floors with a single room on each floor and very few creature comforts. There were some scandals and inter-family tensions and feuds, some of which were settled in court. There were tragedies, such as the terrible injuries to William Pitman’s son, whose clothes were set alight by a candle and David Green, killed in a railway disaster at Charfield. By 1938, Scott’s Court was caught up in the slum clearance programme, with No’s 2 and 3 slated for clearance. The war intervened, though, and the Council took them over and renovated them, at £15 per house, to help with the emergency demand for housing. They didn’t survive long after the war. The last record in the press is a small-ad in 1946, where Mr Northey was selling his motorcycle, a Brough twin, for £15. By 1960 all three cottages had gone and the alley became just a memory.